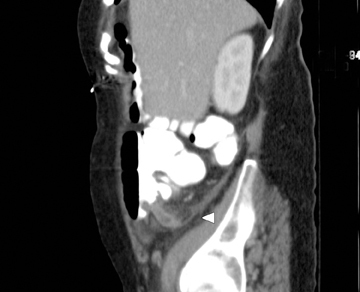 CT images demonstrated a dilated blind-ending tubular structure measuring 1.4 cm in diameter, and extending from the base of the cecum with associated inflammatory fat stranding, consistent with an inflamed appendiceal remnant (Figure 1). Residual staples from prior appendectomy were noted at the distal aspect of the remnant. A sagittal reformatted image showed an inflamed, appendiceal stump without free intraperitoneal air or abscess formation (Figure 1). The patient underwent laproscopic appendectomy with removal of a residual 4-cm-long inflamed appendiceal stump. 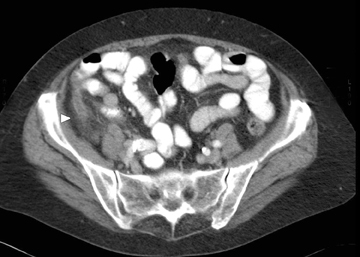 The pathology report described appendicitis within the residual appendix without perforation. A review of previous imaging studies revealed a CT scan of the abdomen and pelvis performed for cancer staging one month prior to the current visit. This scan showed a thin appendiceal stump in the right lower quadrant with surgical clips from prior appendectomy (Figure 2). A more remote CT scan of the abdomen and pelvis performed approximately 29 months before revealed appendicitis with an associated appendicolith. A laparoscopic appendectomy was performed with pathology confirming the diagnosis (Figure 3). Stump appendicitis is a rare entity that occurs as a result of inflammation of the appendiceal remnant. It may occur from 2 months to 50 years following either laproscopic or open appendectomy.1,2 The true incidence of stump appendicitis is unknown; however, with the recent wide availability and liberal utilization of CT for evaluation of abdominal pain it is being recognized more often. The first documented case was reported in 1945 by Rose, and since then several cases have been reported in the surgical literature.3 It is now being described with greater frequency by radiologists and emergency room physicians, suggesting a greater acceptance and awareness for this entity. 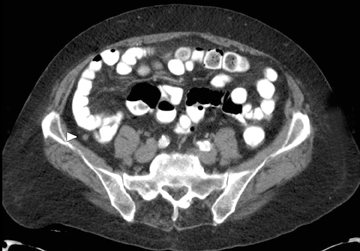 CT findings include a dilated and inflamed tubular structure arising from the cecum and separate from the adjacent small bowel. The inflamed stump has been reported to range in length anywhere from .5 to 5.1 cm.2,4 Additionally, there may be signs of prior surgical intervention with residual staples at the end of the stump or inflammatory stranding in the right lower quadrant. Associated complications such as free air or fluid collection can also be detected by CT.
Due to the seriousness of this illness, early recognition is imperative. Cases reported prospectively may obviate serious complications such as perforation or abscess formation.5-7 The clinical symptoms of stump appendicitis resemble that of acute appendicitis: nausea, vomiting, abdominal pain, anorexia and leukocytosis. Patients relate a history of appendectomy which may bias physicians against the diagnosis of appendicitis. 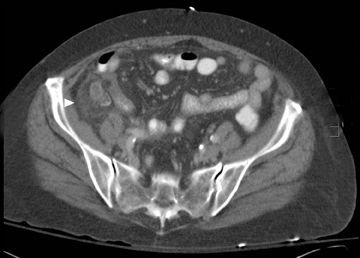 In this case, CT was used to prospectively suggest the diagnosis of stump appendicitis, with pathology confirming the diagnosis. We were also fortunate to be able to show the elegant evolution of the disease process with previous CT scans. Wright TE, Diaco JF. Recurrent appendicitis after laproscopic appendectomy. Int Surg. 1994;79:251-252. Mangi AA, Berger DL. Stump appendicitis. Am Surg. 2000;66:739-741. Rose TF. Recurrent appendiceal abscess. Med J Aust. 1945;32:652-659. Watkins BP, Kothari SN, Landercasper J. Stump appendicitis Case report and review. Surg Laparosc Endosc Percutan Tech. 2004;14:167-171. Rao PM, Sagarin MJ, McCabe CJ. Stump appendicitis diagnosed preoperatively by computed tomography. Am J Emerg Med. 1998;16:309-311. Thomas SE, Denning DA, Cummings MH. Delayed pathology of the appendiceal stump: a case report of stump appendicitis and review. Am Surg. 1994;60:842-844. Shin LK, Halperin D, Weston SR, Meiner EM, Katz DS. Prospective CT diagnosis of stump appendicitis. AJR 2005;184:S62-S64.